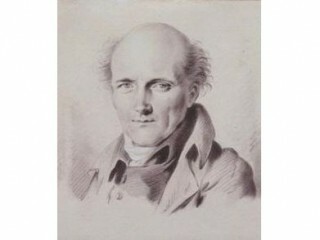 Pierre François Léonard Fontaine was a neoclassical French architect, interior decorator and designer. Starting from 1794 Fontaine worked in such close partnership with Charles Percier, originally his friend from student days, that it is difficult to distinguish their work. Together they were inventors and major proponents of the rich and grand, consciously archaeological versions of neoclassicism we recognize as Directoire style and Empire style. One of their major collaborations was the Arc de Triomphe du Carrousel. Fontaine was born at Pontoise, Val-d'Oise and died in Paris. Following Charles Percier's death in 1838, Fontaine designed a tomb in their characteristic style in the Pere Lachaise Cemetery. Percier and Fontaine had lived together as well as being colleagues. Fontaine married late in life and after his death in 1853 his body was placed in the same tomb according to his wishes.